Bushwalk Australia • View topic - Osprey "Almighty Guarantee"
"Osprey will repair any damage or defect for any reason free of charge – whether it was purchased in 1974 or yesterday. If we are unable to perform a functional repair on your pack, we will happily replace it." The fine print suggests that they might not live up to this promise if you're outside of the USA, so I was pleasantly surprised when the local distributor informed me that they would replace my pack. Due to the extensive damage (not just the rat holes, also a damaged zip and a broken shoulder strap loop thingy) they wouldn't repair it. This is unfortunate, as I prefer the old model to the current one, but beggars can't be choosers. It's possible the new model is slightly more durable, which would be good. I'll just need to buy a couple of hipbelt pockets to add on. I also have an Exos 48 with a hole in a side pocket. This they are going to repair, free of charge. Excellent customer service. I thought others might be interested to hear that this guarantee is legit. The almighty guarantee was a factor in my decision to pick up an Exos 58 and Hornet 40 off here - I can use them as they are intended, safe in the knowledge that Osprey will support it through the long haul. In fairness, I have also bought an Osprey Poco Premium kiddy carrier, so I have also paid into the brand. Very interesting and honestly surprising... How old is the pack? I own several osprey packs. I did note that the Australian osprey website and the website of the retailer I purchased my osprey pack from both promoted the almighty guarantee in big bold headlines. The australian osprey website has since removed some of that branding but its still fairly prominent. 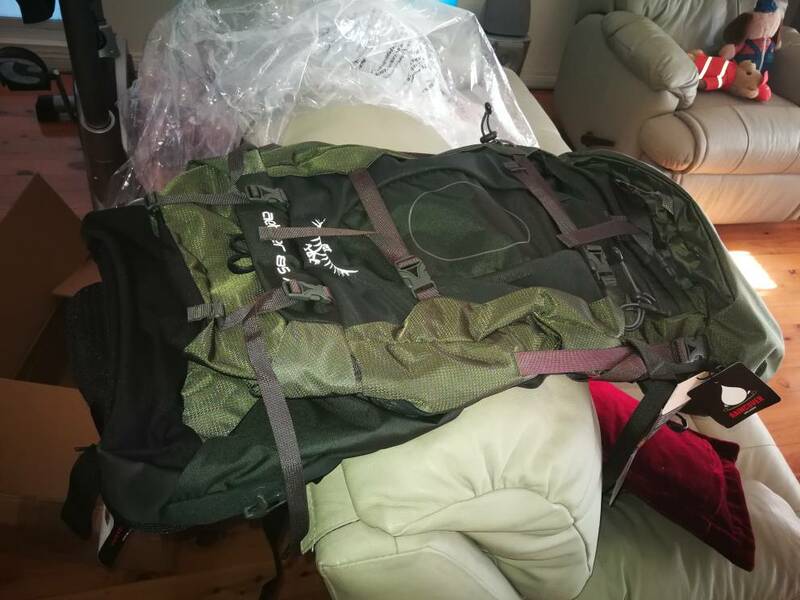 So, when my first pack was delivered I was surprised to find a tag from the Australian distributer stating the pack was only warrantied for 18 months for manufacturing faults only and this did not include wear and tear or damage. I remember being annoyed as one of the factors in my purchase was the "almighty guarantee" for repair or replacement regardless of age or reason for damage. So very pleased to hear that they do in fact honour it.. Perhaps the tag was to reduce an open season on claims. I’m not positive but I think the US osprey packs are more expensive than in Australia? Perhaps because US people do actively use the osprey warranty a lot. I have an Exos 48 and the side and back pockets are close to shredded. So I can contact the distributor and they will replace or fix free of charge? Thats amazing! I would have thought that was just general wear and tear and that the pack had reached the end of it's life. Good news. After various packs over the years, Osprey Volt 60 is a pleasure to use even with a weeks food on board. Im careful with my gear as for me low impact walking philosophy encompasses purchase of equipment. Buying excessive amounts of gear has a greater environmental impact than a noodle wrapper or camp fire in a nat park. Im amused when an environmental crusader whines of bush bogans lighting fires, yet own 8 packs, 5 sleeping bags, 3 mats and more walking clothing than you can shake a stick at, made by kids in developing countries with poor manufacturing practices. Repair rather than replace. The 'right replace movement' is growing in white goods for a reason as we move toward more sustainable consumer behavior. Heremeahappy1 wrote: Good news. After various packs over the years, Osprey Volt 60 is a pleasure to use even with a weeks food on board. Im careful with my gear as for me low impact walking philosophy encompasses purchase of equipment. Buying excessive amounts of gear has a greater environmental impact than a noodle wrapper or camp fire in a nat park. Im amused when an environmental crusader whines of bush bogans lighting fires, yet own 8 packs, 5 sleeping bags, 3 mats and more walking clothing than you can shake a stick at, made by kids in developing countries with poor manufacturing practices. I must admit I did find it kind of odd when joining this forum the sheer amount of gear that people seemed to own and the rate that some upgrade at. Nice to hear Osprey gear is getting fixed for free in Oz, however if I had a pack that was just worn out I don't think I could bring myself to lodge a claim. I have never owned Osprey stuff but hearing that is supported well will bump it up my list for sure, I think our only local stockists are bikes shops. Hahaha. That's what I've read too. Probably not a bad thing for me as I sometimes struggle to get the hip belt tight enough. I obviously need some pop tarts in my life! Seriously, can you believe that's a thing over there?! They seem to eat nothing but packet noodles, snickers and pop tarts! I've now started browsing hip belt pockets by various US cottage manufacturers. A bit expensive but considering I bought the pack second hand for $110 not so bad. One Planet also make a hip belt pocket but it weighs 2-3 times as much as the Zpacks, MLD, Gossamer Gear ones. Totally agree. This is one problem with getting lured into lightweight everything. Lighter stuff (especially packs) is usually less durable, although the design plays a big role (too many exterior pockets made from flimsy mesh on the Ospreys compared to some of the ultralight packs by cottage manufacturers). Apart from my complaint about the new Exos not having hip belt pockets, it's unfortunate from an environmental perspective that they won't repair the pack. It could be repaired, but I guess it would just cost them too much to be viable. So far they haven't actually asked me to return the damaged pack, so it's possible it can still get some use. The lid is wrecked but it's designed to be able to be used without the lid anyway. Just thought to add my current experience with the osprey warranty to this thread. When I purchased my pack I never even considered the warranty guarantee but now I'm glad it has it. Somehow I've managed to wear out the inner lining in a small section through to the frame which began to rust. Maybe neglectful packing at one stage. Potentially it would lead to pack failure but nothing that dramatic nor anytime too soon. Still plenty of life in it. This thread got me thinking about getting the pack repaired. Anyways, I was surprised at the lack of questions asked about the pack. After having the claim assessed I was told to destroy the old pack and send them a photo of it. Afterwards, I would be sent out a brand new one. Just received the new pack today which was delivered by courier. It's a shame they made me destroy the old one as it still would have lasted for a while. But super stoked at the new pack. Genuinely impressed at ospreys warranty/guarantee. I doubt it, I shot them an email a few years ago when they were still advertising jackets with waterproof zippers, sounded like a few people complained and they changed the wording on the site. They still sold rain jackets with no waterproof pockets though, hahaha!